A great day of cooking and preparing all sorts of goodies on the weekend to take away with me for the Christmas feasting. I also like a little bit of tradition so quite excited to have found a butcher to make little pork chipolatas. We always had them at home along with the turkey, lovely little sausages wrapped in bacon...love them and it will be a little bit of home at my Kiwi Christmas. Hard to believe that by this time next week Christmas will be over and I'll be on to planning Hogmanay. Being Scottish Hogmanay is a big deal and could not possibly go uncelebrated. In Scotland it is even bigger than Christmas. I do love to herald in the New Year with good food, good wine, a little music and of course good company. Back to Christmas and the bacon wheels are in the freezer for a little Christmas day nibble...little swirls of puff pastry and bacon make for a tasty morsel and so easy. All you need is a sheet of puff pastry and a packet of streaky bacon. Lay out the pastry and lay the bacon on top and then roll it up. Chill in the fridge to make it easier to slice in to rounds or it can be frozen and then just whipped out when you need it. 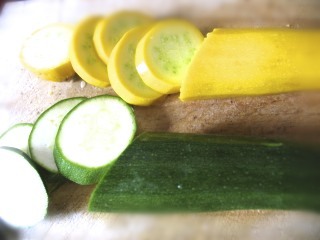 Let it thaw a little and then slice in to rounds, before thawing completely and placing on a backing tray. Bake for 10-15 minutes at 190C or until the pastry is cooked through and golden. These are guaranteed to go down a treat. Salty bacon and crispy golden puff pastry, what's not to like. I even like the left over ones cold, you know when you think you couldn't possibly eat any more but you just have that little craving for something. That something for me is usually savoury and these hit the spot, as do the chipolatas wrapped in bacon, that is if there are any left! 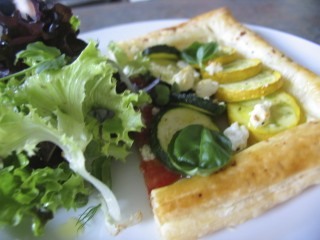 I had a little puff pastry left over and yet more zucchini, some lovely yellow ones too, so I came up with this colourful little tart. Very easy to whip up and it tasted pretty good to. 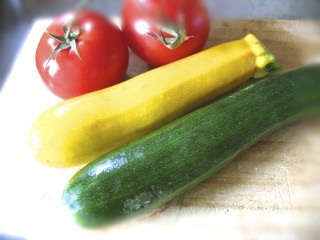 With the green and yellow zucchini and bright red tomatoes it is also a feast for the eyes. It would make for a light lunch or supper with some salad. Light is most definitely good after all those festive indulgences. Score round the puff pastry an inch or so from the edge, basically like make a little bit of a frame in which to place all your colourful ingredients. Just like making a picture. With a fork just prick over inside the square. 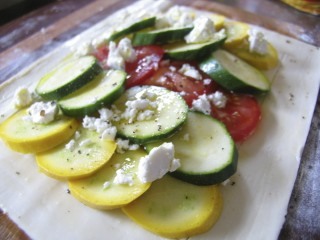 Place rows of the zucchini and tomato and crumble over the goats cheese inside your picture frame. Season with salt and pepper and drizzle with lemon on olive or some really good extra virgin olive oil. Place in the over for 15 - 20 minutes until the puff pastry is cooked through and golden. Garnish with a few basil leaves. 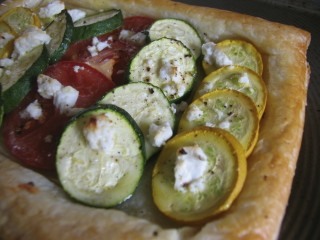 The zucchini still had a little crunch, the sweetness of the tomatoes and the freshness of the lemon oil, plus the creamy salty goats cheese and the fragrant basil, all made for one tasty tart.